Oakland Park was named for the massive stand of trees that lined the Middle River. Our first permanent settlers were the Whidby family, who came from Georgia to South Florida in 1901, when the area was known as Colahatchee. By 1918, other farming families had moved into the area, and bean and pepper fields were abundant. In 1923, a Miami development company initiated the Oakland Park subdivision with one of the biggest barbecues ever held in Broward County, with an estimated attendance of 5,000 people from Dade, Broward, and Palm Beach Counties. The city was incorporated first as Floranada in early 1925 by the American-British Improvement Company, a group of international investors. Plans for the resort included two 18-hole golf courses, a polo field, an aviation field, tennis courts, and a yacht club. It was intended to rival Palm Beach, but this vision was carried away with hurricane winds on September 18, 1926. Bankruptcy and devastating damage brought the development to an end. Despite offers from Fort Lauderdale and Pompano Beach, the citizens of Oakland Park agreed that the community could be run more efficiently as an independent city. The city was reorganized and reincorporated as Oakland Park on July 1, 1929. 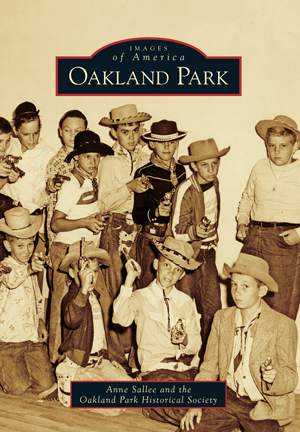 Anne Sallee and the Oakland Park Historical Society have compiled the best photographs from their collection, the Broward County Historical Commission, and private collections to celebrate Oakland Park's 80th birthday on July 1, 2009.